Nurse practitioners (NPs) play an increasingly important role in healthcare. Not only is the NP population growing at a rapid rate—the American Association of Nurse Practitioners (AANP) reports that the number of licensed NPs nationwide has doubled since 2007 to nearly 250,000—but their practice style is also particularly effective. NPs are often distinguished by their ability to engage with patients and embrace shared decision making. Offering patients active roles in their healthcare decisions can improve outcomes and decrease medical costs. Preventive health strategies, such as colorectal cancer (CRC) screening, are an example in which patient involvement and shared decision making can make a significant difference in getting more individuals screened. The AANP, in partnership with the independent nonprofit organization HealthyWomen, recently conducted a survey designed to examine NPs’ knowledge and practice patterns around CRC screening. 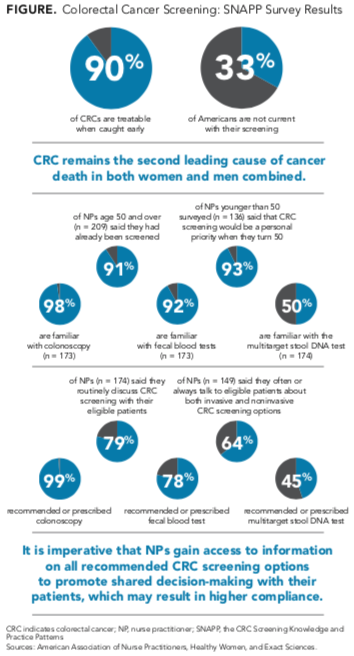 The survey found that CRC screening is a personal priority for NPs: 91% of respondents eligible for screening reported they had been screened. For respondents younger than 50 years, 93% reported that CRC screening would become a priority when they turn 50. The survey results also revealed an opportunity for the majority of participating NPs to educate their patients about the risks and benefits of all CRC screening options. The United States Preventive Services Task Force gave CRC screening an “A” rating for individ- uals aged 50 to 75 years and recommended 7 screening options.3 However, most NPs who responded to the AANP survey indicated they were not familiar with every screening option. Given the recent update to the American Cancer Society’s CRC screening guidelines,4 there is heightened awareness around this healthcare issue. The updated guidelines endorse a range of CRC screening options, noting that the “initial test does not have to be a colonoscopy... Instead, it could be one of several other tests, including home stool tests available by prescription.” Now is the time for NPs to leverage their ability to engage and educate their patients about all screening options to increase CRC screening rates. Brenda Boutin of Savannah, Georgia, is one patient whose life was significantly impacted by her NP’s knowledge. Boutin’s NP, Mary McCourt, recommended Cologuard, the noninvasive home stool DNA test, for CRC screening to accommodate Boutin’s busy lifestyle. Together they discussed this option, along with others, and Boutin agreed to take the Cologuard test. A positive result necessitated a follow-up colonoscopy, which revealed early-stage, yet treatable, CRC. Now healthy, active, and free of cancer, Boutin credits McCourt for helping her decide which CRC screening test was best for her. NPs are in the position to guide their patients through learning and shared decision making by offering up-to-date health information. The current and future growth in the NP population means that there are hundreds of thousands of NPs like McCourt who can encourage patients to engage in preventive health decisions and empower them to take charge of their health. To view the Colorectal Cancer Screening: SNAPP Survey Results, Click here. Philip Parks, MD, MPH, is the senior director of medical affairs, Exact Sciences. He is a board-certified practicing physician who served in the US Navy and has clinical, corporate medicine, and managed care experience.